Samsung’s La Fleur series transforms handsets you know into flower-themed devices targetting the most girly girls and the series is particularly popular in countries like Russia. 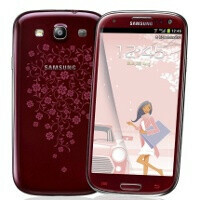 And while previously, the La Fleur treatment was only given to lower end devices, now Samsung is releasing La Fleur for smartphones and even the top of the line Samsung Galaxy S III will get adorned with pink flowers. Samsung Galaxy La Fleur will launch in Russia in 2013, and that is the first year when Samsung will not offer La Fleur feature phones as it fully transitions to smartphones. The Samsung Galaxy S III, S III Mini, Galaxy Ace 2 and the dual-SIM Galaxy S DUOS и Galaxy Ace DUOS will all get a white and red/pink versions. Good news the prices of the La Fleur-themed devices won’t be any higher than the original devices. And of course, Samsung is timing this right for St. Valentine’s day on February 14th. Looks like Sammy is slowly stalling in the innovation dept. well it happens. Nice try, but this isn't the Galaxy S3S or Galaxy S4, this is just a minor refresh for the Galaxy S3 line. What? The pink Note is one of the nicest Samsung phones I've ever seen, maybe because of the metal looking finish on the front.